South Africa on Friday moved to halt an online auction of rhino horn starting next week, as outraged conservationists said the sale would undermine the global ban on rhino trade. Hume's lawyer Izak du Toit claimed the permits had already been approved—but not issued. The High Court in Pretoria started hearing the case on an urgent basis on Friday. The court is expected to make a decision on Sunday, shortly before to the auction is scheduled to open at midday (1000 GMT) on Monday, officials said. He has stockpiles of six tonnes of horns and wants to place 500 kilogrammes or 264 horns, under the hammer. 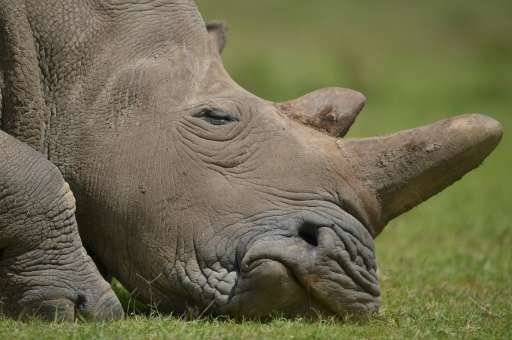 South Africa is home to around 20,000 rhinos, some 80 percent of the worldwide population, but in recent years has suffered record slaughter by poachers. It is sold in powdered form as a supposed cure for cancer and other diseases—as well as an aphrodisiac—in Vietnam and China. Rhino horns are highly prized, estimated to fetch up to $60,000 a kilo on the black market - more than the price of gold or cocaine. Johan Van Eyk of Van's Auctioneers who will conduct the auction said there is no set opening price because this will be the first ever rhino horn auction. "We will have to look at what people are willing to pay and that will give us an idea of the price on the legal market," Van Eyk told AFP. The association of private rhino owners is banking on the planned auction to determine demand and the "fair market" value of the horn, according to its president Pelham Jones. Hume is also planning a physical auction in September. South Africa has over 300 private rhino breeders who say they have spent more than two billion rand ($150 million) to protect their herds over the past nine years. The farmers hope to recuperate expenses from the sale of the horns taken by dehorning rhinos. "The (security) burden has now become so severe that many rhino reserves simply cannot afford any longer," said Jones. But for animal rights activists, the legal sale of rhino horns will only fuel poaching. "It's going to exacerbate it," said Dex Kotze, a South African wildlife activist. "Is this a money making scheme or do they want to save the rhino?"